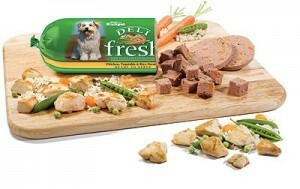 I’ve seen Freshpet Select dog food in the refrigerator section of the pet food aisle in stores before. It’s right next to the Biljac frozen dog food that I always buy for my dog. I’ve considered buying Freshpet refrigerated dog food and serving it up in small doses as special treats for my dog — just like I do with the Biljac. (I often give premium brands of dog food as “treats” to my dog.) It would also make great filler for Kong toys that my dog enjoys so much. 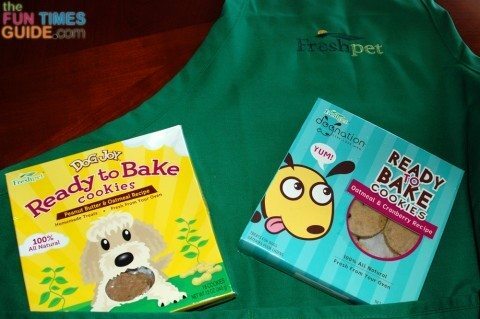 Ready to Bake Cookies for dogs are the newest item added to the all-natural pet food line-up at Freshpet. The folks at Freshpet invited me to try their new dog treats, and I jumped at the chance. Are you kidding? I’ve heard great things about the company and their all natural dog food products. 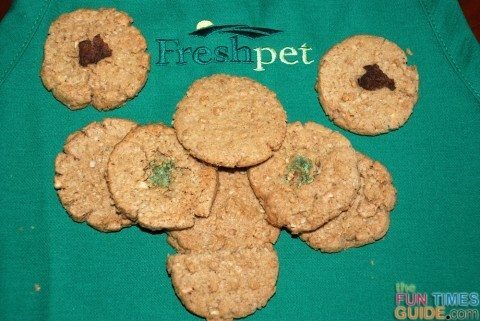 So yeah, I’d love to introduce Freshpet “homemade” dog cookies to my dog and see what he thinks! 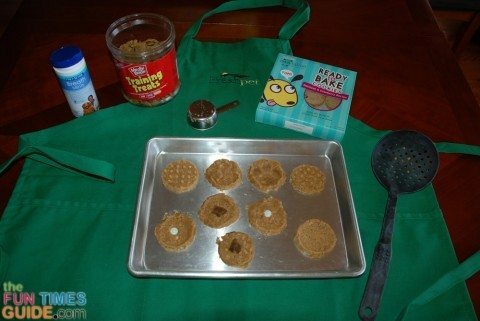 And personally, (as long as they’re priced low enough) I would love to keep ready-bake dog treats like this on hand for special occasions and fun treats. For starters, I can’t believe how awesome the packaging was for these Ready to Bake Cookies for dogs. 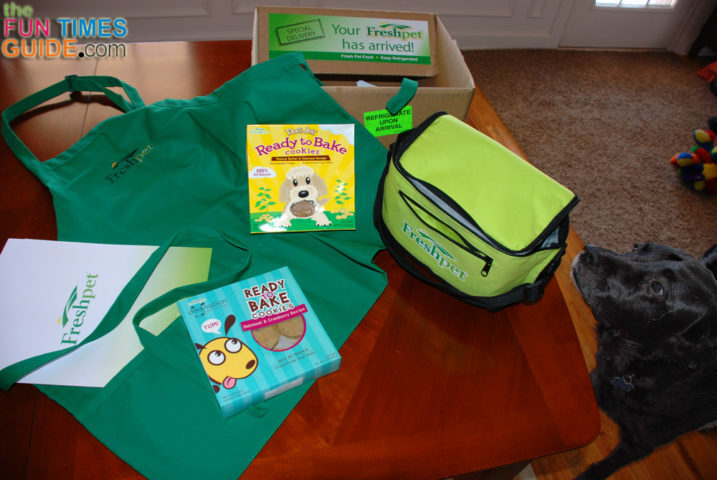 Freshpet included a super high-quality apron and a fun zippered cooler — that perfectly fit 2 boxes of Ready to Bake Cookies and 2 ice packs to keep them cold during shipping. I got a box of Peanut Butter & Oatmeal cookies and a box of Oatmeal & Cranberry cookies. I started by making a half batch (half the box) of the Peanut Butter & Oatmeal cookies. Ready To Bake Cookies Are Quick & Easy! For one, they did all the hard work of gathering the ingredients, mixing up the ingredients, and forming the dough into little cookies. 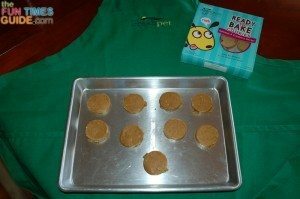 Each box of Ready to Bake Dog Cookies includes 18 perfectly round little patties… ready for baking! The package directions say to flatten each cookie patty prior to baking. Instead of using the palm of my hand, as they suggest, I used the smooth bottom of a metal measuring cup. TIP: Unless you spray it first with some vegetable oil, the cookie patties will stick to the measuring cup. And a broken cookie patty won’t go back into a perfect circle. On some, I used a multi-holed cooking spoon to press a pattern into the tops prior to baking. After baking, it was similar to the look of the cross marks on human peanut butter cookies. On others, I simply pressed a single “chunky” piece of dog kibble or dog treat into the center of the dough. I like how the ones with the chunky dog kibble in the center look like Hershey Kisses cookies that my mother-in law makes for us each Christmas. Sprinkle parsley on top (or press some into the cookie patty itself) — helps with doggie breath. Press several small pieces of dog kibble into the pre-shaped cookie patty (instead of one big piece like I did with the first batch) — just for variety. For non-peanut butter flavored ones (like the Freshpet Oatmeal & Cranberry cookies, I might add some bits of chunky peanut butter on top of a few cookies prior to baking (or maybe after baking, if they turn out to be a flavor that he doesn’t like) — because he’ll eat anything with peanut butter in it or on it. Did My Dog Like The Ready To Bake Cookies? Heck yeah — he loved them! Seriously. When I opened the box, it was as if he sensed that what was in this box was for him. His Drool-o-Meter kicked into high gear moments after I opened the box. Then, as I was preparing the cookies prior to baking (remember, there’s really no preparation necessary — just put ’em on a cookie sheet and bake for 10 minutes — but I chose to spend a couple extra minutes jazzing them up just because), he sat quietly on the rug next to the table… just waiting… patiently. However, his jowls sprung a leak! Drool started dripping at high speed from the corners of his mouth. As the cookies were baking, I figured I had 10 minutes to finish that project I was working on upstairs. My dog follows me everywhere — even upstairs. But he didn’t budge! He remained on the rug in the kitchen with his eyes glued to the oven. He knew there would soon be some heavenly goodness coming from there! When I took the cookies out of the oven, he couldn’t believe it when I didn’t start serving them up. And I couldn’t believe how much they looked and smelled just like regular, peanut butter cookies — for people! They smelled identical to the real thing. Finally, after the cookies had cooled, I gave him his first taste. “To die for!” was the look he gave me. But when he finds something he likes, he’s all over it. 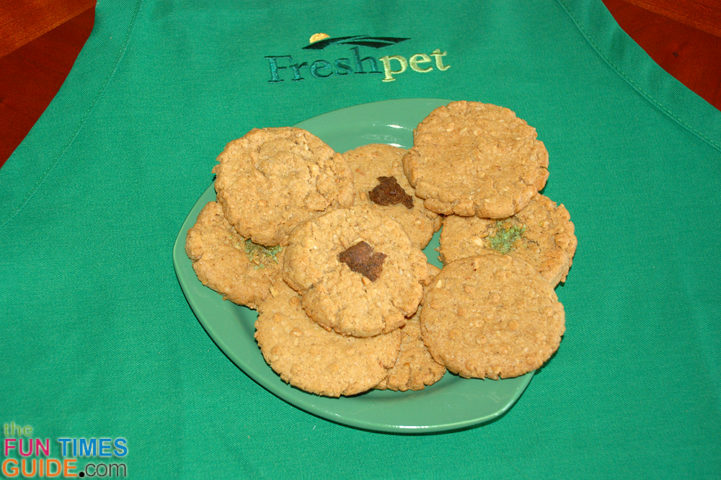 These Ready To Bake Cookies from Freshpet apparently fit the bill! He went on to gobble up 2 more cookies right away. Of course, peanut butter is his flavor of choice. So the fact that the smell of fresh-baked peanut butter cookies filled the room didn’t hurt. I can’t wait to see how he likes the Oatmeal & Cranberry ones. Homemade dog treats can be storebought! Personally, I like giving my dog extra-special homemade treats like this only on rare occasions. So the 2 boxes of 18 cookies per flavor will last us a long time. I’d like these dog cookies even better if they were just a tad smaller. Straight out of the box and baked as directed, they’re average-sized — like human cookies. For most people, the Ready to Bake cookie sizes will be perfect. For me, I cut them in half because my dog already gets a lot of treats in a day. (Every time he comes on command — like after he’s been playing outdoors — which is several times each day. And any time he does anything else “on command”. Yeah, he’s always “in school”.) Therefore, smaller portions are better for us… and make it possible to spread out the goodness over more days! From here on, I plan to make only 2 or 3 cookies at a time, and then re-freeze the remaining uncooked cookies each time. To make it even easier, with no time spent waiting to pre-heat the oven, I’ll just stick a couple of the cookies on a cookie sheet immediately after I’ve used the oven to cook a meal for hubby and I. That way, it’s conserving energy a bit too. Most of all, I love the fact that these “homemade” dog treats are made with all-natural ingredients. And they’re super-fresh the moment you open the box. Because fresh is best! Currently, Freshpet is the only brand of fresh, refrigerated pet food in the market. All Freshpet dog foods are made in the United States. Freshpet foods are available in multiple forms to address the preferences of the pet and the owner (pet’s size, convenience, flavor preference of the pet). Freshpet Select Roasted Meals are made from all natural ingredients and do not contain corn, wheat, fillers, or by-products. Each recipe starts with high quality proteins, vitamin-rich vegetables, and high fiber grains. The ingredients are gently cooked to retain their nutrients without the use of any artificial preservatives. Freshpet Vital Complete Meals recipes are grain-free and contain 80% or more animal protein, providing an easily digestible and 100% complete and balanced meal. Each recipe is made from all natural ingredients and never contains corn, wheat, soy, or by-products. The ingredients are gently cooked to retain their nutrients without the use of any artificial preservatives. Furthermore, Vital recipes were created to mimic carnivorous diets. They contain 80% or more fresh poultry, meat or fish, are free of grains and include pomegranates, dark berries, and leafy greens for antioxidant support. VItal Complete Meals are a safe alternative to raw feeding and home cooking regimens. Just to be clear, Freshpet foods are not organic. “Few if any pet foods are 100% organic due to difficulty in sourcing organic ingredients as well as their costliness. At Freshpet our focus is on finding the highest quality, freshest, all natural ingredients. The natural flavors are a proprietary blend of ingredients such as vinegar, celery, lemon juice, and natural hickory. The total amount is less than 2% of the recipe. These flavors enhance the natural flavors of the meat. Freshpet can be frozen and stored for future use. 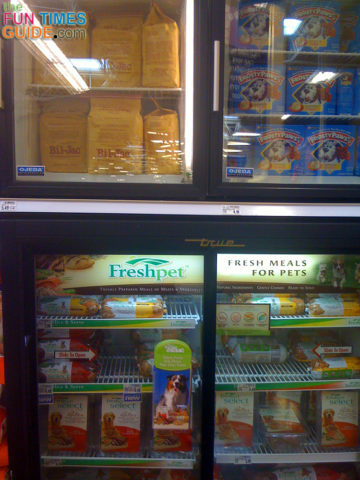 However, no Freshpet foods are frozen before you purchase them in your local store. If you choose to freeze the food, you may see a slight change in color and texture when thawed out. Here’s where you can find Freshpet dog food and treats near you. (Near me, they’re available at Kroger, Walmat, and Petco.) Some Freshpet products are also available online on Amazon.